WSU Enviornmental Engineering Prof. Shawn McElmurry was part of a team of researchers studying the outbreak in 2016. However, on the stand today, McElmurry testified that their efforts to collect samples from Flint residents’ homes ran into resistance from state officials, including Michigan Department of Health and Human Services director Nick Lyon. McElmurry recounted several meetings with state officials between May and August, 2016. 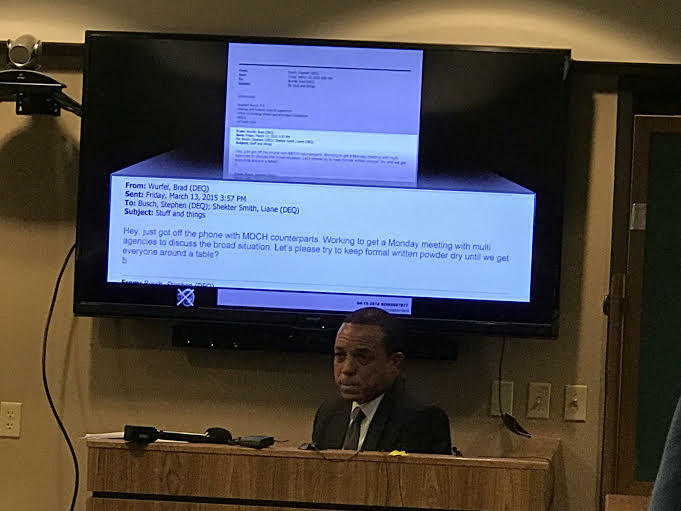 McElmurry says Lyon and other state officials were particularly concerned about the researchers’ plans to collect water filters Flint residents were using to screen out lead in their tap water. A judge will decide if there is enough evidence to send an involuntary manslaughter charge against Nick Lyon to trial. Lyon’s defense attorney frequently objected during McElmurry’s testimony, complaining many statements amounted to hearsay. Lyon is one of 13 current and former government officials criminally charged in connection with the Flint water crisis. Court hearings resume next month for state officials criminally charged in the Flint water crisis. Nick Lyon’s preliminary exam is scheduled to continue the day after Halloween. Lyon is the director of the Michigan Department of Health and Human Services. He’s charged with involuntary manslaughter in the death of a man who died of Legionnaires Disease. It appears many officials in the Snyder administration were aware of a deadly Legionnaires' disease outbreak in Genesee County in early 2015. But they didn’t want to let the public know. State health department officials knew of the Legionella outbreak in January 2015. However, the government didn’t inform the public until January 2016. At least 12 people died and dozens more were sickened by the Legionnaires' outbreak, which may have been linked to the Flint water crisis. State health department director Nick Lyon is among several government officials facing involuntary manslaughter charges in connection with the outbreak.